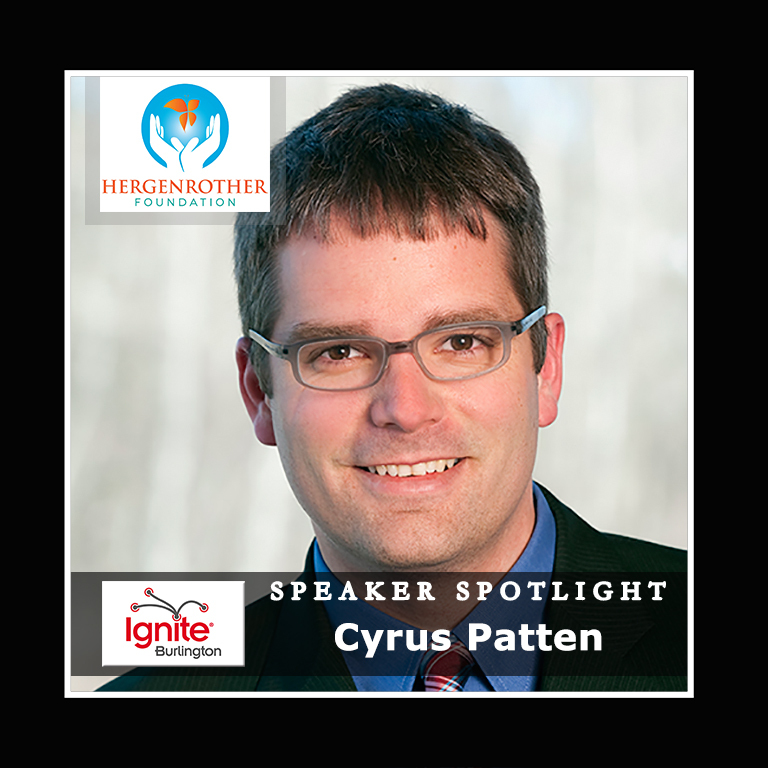 Cyrus Patten has served in senior leadership positions at some of Vermont’s most notable nonprofit organizations including Howard Center and Spectrum Youth & Family Services. He is currently serving as Campaign for Vermont’s first Executive Director. He earned his Bachelors and Masters degrees from Colorado State University and is a doctoral candidate in Higher Education Leadership and Policy Studies at the University of Vermont where he is studying alternative models for funding nonprofit organizations. Cyrus thrives in challenging and dynamic environments, breaking convention and seeking new ways to solve old problems. Ignite Burlington 2015 will be held on Thursday October 15 at The Film House at Main Street Landing. All proceeds from the event will go towards the Hergenrother Foundation. Reserve your Ignite tickets here. This entry was posted in Events, Ignite Burlington, Ignite Speaker and tagged adam hergenrother, adam hergenrother ignite, burlington fall events, campaign for vermont, campaign for vermont cyrus patten, campaign for vermont executive director, cyrus patten, cyrus patten non-profits, events in vermont in october, hergenrother enterprises, hergenrother foundation, ignite burlington, ignite burlington vt, ignite vermont, ignite vt, mind spark, vermont's economic future on October 8, 2015 by Hallie. Ignite Burlington 2015 Speaker Announcement! COLCHESTER, VERMONT (September 9, 2015) – Adam Hergenrother and Hergenrother Foundation are hosting the 4th Annual Ignite Burlington on Thursday October 15, 2015 at The Film House at Main Street Landing. Ignite is an exciting, unconventional event, designed to inspire, educate, and entertain the greater Burlington community. Ignite events are held in over 100 cities worldwide and are similar to TED’s ”Ideas Worth Spreading.” Ignite events bring people together in an inspiring, mastermind-like forum, where speakers share their passion projects and inspirational success stories for compelling five minutes, respecting Ignite’s acclaimed mantra, ”Enlighten Us, But Make It Quick.” Click here for more information: www.hergenrotherfoundation.org/events. Registration and networking from 5:30pm-6:30pm. Light appetizers and a cash bar will be available. Presentations begin promptly at 6:30pm. Tickets are extremely limited and are on sale now for $15.00. For more information and to purchase tickets click here. Tad Cooke – Founder, New Moran, Inc.
Hergenrother Foundation’s mission is to empower today’s youth to become tomorrow’s confident and dynamic leaders by providing the necessary resources, programs, and events for youth to learn, grow, thrive, and develop into outstanding members of their communities. By supporting Hergenrother Foundation, you are investing in the future of your community. Our youth leadership programs and camps will teach youth to dream big, act with purpose and passion, and serve others first. Hergenrother Foundation is also dedicated to bringing educational and inspirational events to the Greater Burlington area, to heighten awareness for the power that every person, regardless of age, can live a life without limits. For more information, visit www.hergenrotherfoundation.org. This entry was posted in Events, Ignite Burlington, Ignite Speaker and tagged adam hergenrother, big heavy world, campaign for vermont, chris kaiser, christine dodson, cyrus patten, eugene korsunskiy, fall events, governor jim douglas, hergenrother enterprises, hergenrother foundation, ignite adam hergenrother, ignite burlington, ignite burlington vt, ignite vt, james lockridge, janice shade, louisa shibli, mamava, michael jager, milk money vermont, mind spark, mind spark ignite, moran plant, october vt events, sascha mayer, solidarity of unbridled labour, tad cooke, vermont peanut butter on September 9, 2015 by Hallie.